A lot of quality superhero games have emerged in the last decade, the most notable occurrence of a great triumph being Batman's return to the circles with 2009's Batman: Arkham Asylum. However, before the emergence of undoubtedly the greatest series of licensed games ever made, critics were enjoying the hell out of Spider-Man. 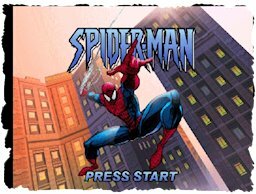 Activision have taken it upon themselves to produce a long string of Spider-Man games, based on both the comic books as well as Sam Raimi's movie trilogy, and for most of these games, they have enjoyed a raving response, most notably 2004's Spider-Man 2, which is often regarded as a very influential sandbox game and one of the greatest licensed games in history, and 2010's surreal Spider-Man: Shattered Dimensions. Due to the existence of another Activision game entitled Spider-Man, based on the movie and released in 2002, modern gamers tend to forget the first fruit of Activision's successful revival of the ever-exciting webslinger, which arrived to please PlayStation owners in the summer of 2000. 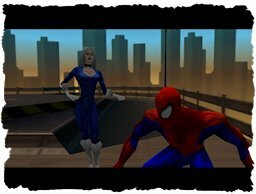 A few months later, Nintendo 64 owners got a taste of what critics were calling the best superhero game ever made at that time. I'm pleased to say time's been fairly kind to Spider-Man. While attending a demonstration held by Dr. Otto Octavius - who seems to have changed his ways - Peter Parker witnesses a Spider-Man impostor crashing the show and stealing Octavius' invention. A manhunt is issued for Spider-Man, who is after the true culprits on a manhunt of his own. Meanwhile, Venom kidnaps Mary Jane and all hell breaks loose all around the city as several supervillains start running rampant. It's one gigantic Marvel Comics showdown, and we're part of it. If you're prepared to see a host of your favourite Marvel characters (a LOT of them, including curiosities like Namor and Silver Surfer) reduced into sculptures of rock and wood very typical to a Nintendo 64 game, you might appreciate the artificial look of the game. They could've at least stylized the cutscenes to resemble a comic book story, but no, they put the blockheads in. Oh well, what the game loses in artificials, it gains in animation - the animation is simply superb. For the first time ever in a Spider-Man game, you truly feel like you're Spider-Man, the character animation is so fluid and goes well with the fluid controls - however, I must once again criticize the N64 controller, which should come as no surprise to anyone who's ever read my reviews of third-party N64 games. This is one of the first of those third-party games I've bumped into, to sport real voice acting - by Spider-Man veterans, at that, including Rino Romano and Efrem Zimbalist, Jr.. Of course, N64's capacity can't handle a full voiceover track, especially for a full 3D game in which you're able to move on just about any surface in a full 3D environment. Sounds awesomely contrary to what I said before about the game's artificial look, but you should know that most of the environment is empty space - there's such a lack of detail that you'd think the game was broken. Spider-Man manages to impress with just about everything except for the quick glance... oh, and the camerawork, as well. It's simply rancid, especially when you zip up to ceilings, in which cases the camera automatically pans up to inside the ceiling instead of staying on your back. Since the camera buttons are used for something wholly else than controlling the camera, you'll just have to wait for the camera to stabilize automatically, or alternatively aim at something. Once you learn to use the camera buttons (one's for a punch, one's for a kick, one's for a straight-ahead webshot) without trying each one each time 'til you hit the right one, and beat a few levels, you'll most likely find beauty in this game. The levels are loosely based on actual comic book stories, interwoven as smaller stories into the game's exclusive plot - hmmm, Arkham Asylum again! It's awesome, not to mention authentic. The occasional voice acting is always on the mark; I'm once again bothered by the messed up proportions between Felicia Hardy's gigantic breasts and blocky head, but I'm done with the graphics. The way the fluid gameplay, thematic levels and the light-hearted, yet plausible voiceover work provide you with that genuine Spidey feel are much more important elements than anything meeting the eye. The actual tutorial sequence of the game is quite short; the action begins almost immediately and the game is quite challenging from the very beginning. The enemies' A.I. isn't really that good, and I guess the developers deliberately toned it down a further bit to prevent the game from becoming unreasonable. You see, in the very beginning of the game there's this room full of hostages and enemy guards, and you pretty much need to incapacitate the guards one at a time, and do it quickly and quietly, 'cause one slip-up to just slightly alert just one guard results in game over, and checkpoints are not this game's strong suit. You haven't necessarily learned everything about the game just yet, it's like the ultimate test. You could say it's a part of the tutorial, 'cause after that sequence, you'll have inevitably learned each skill you absolutely need to beat the game. It might be a little unforgiving start for the game, but trust me: you'll want to go on. Once again, I can't help but to direct you towards the PlayStation version of the game, but this time, the Nintendo 64 version isn't all that bad, since it isn't a hectic beat 'em up (like it well could be), the type of game which I really hate playing on the Nintendo 64. 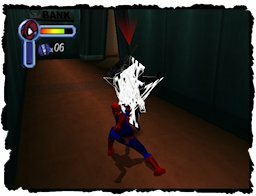 As absurd as it sounds, Spider-Man runs on the same engine as Neversoft's breakthrough megahit Tony Hawk's Pro Skater, and like that game, Spider-Man has (relatively speaking) tons of goodies and modes for you to unlock upon multiple playthroughs or using a cheat. There are several different costumes for Spider-Man, and if you're into something more substantial, there's the surreal "What If?" mode for you to experience. Although the game pretty much plays out the same in this mode, the narrator changes from Stan Lee to Uatu the Watcher (voiced by Laurence Fishburne), and there are even much more curious Marvel cameos for you to spot than in the "real" game. Completing Spider-Man isn't the end, and as a game, it's got quite enough content to keep you glued to the sofa for quite a long bit. 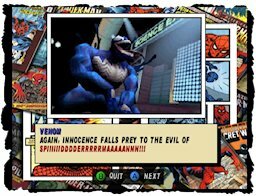 Spider-Man (whether you want to call it Spider-Man 2000 or in this case, Spider-Man 64 - anything to clearly separate it from inferior games that share the title) was the best Spider-Man game of its time, for sure, and still a damn entertaining, recommendable superhero game. Things are finally looking up. + A very authentic Spider-Man feel; actual storylines fitted into a new plot, voiceover work performed by people who worked on the animated shows, etc.